Friday May 25th 1883 It was a rainy forenoon. I was busy about the house till dinner time and went over to Hatts in the afternoon. Ott came down there and we both stayed till after supper I came home to help with the evening work. Saturday May 26th 1883 It was a real pleasant day I had invited the married Robinson girls to spend the day and Hatt brought Edith over in the afternoon. We had an excellent visit. Mr Free was here for dinner and supper I read in the evening. 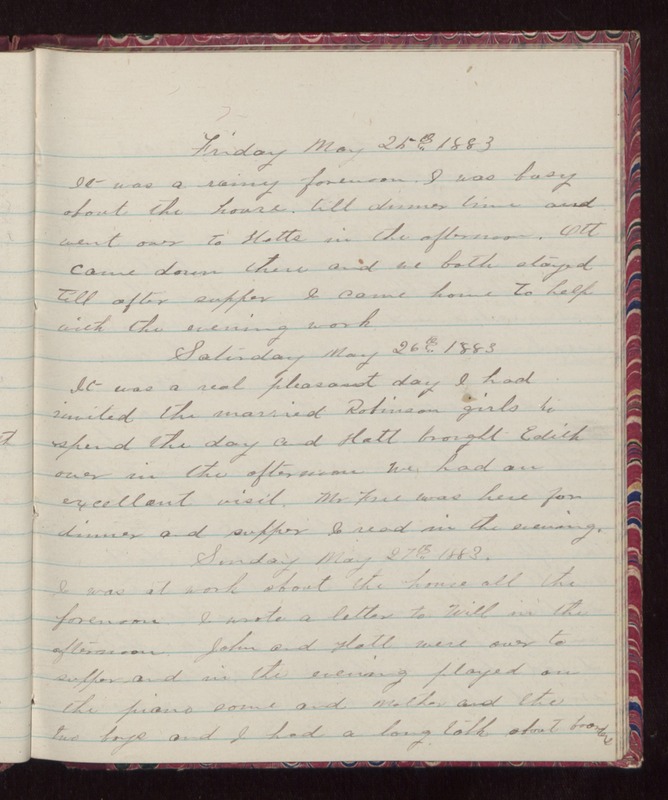 Sunday May 27th 1883 I was at work about the house all the forenoon. I wrote a letter to Will in the afternoon. John and Hatt were over to supper and in the evening played on the piano some and Mother and the two boys and I had a long talk about boarders.